UPDATE: You’ll fine more health spending statistics by age and other characteristics here. H/t @bdhumbert. Sorry, what do you mean by “Medicare coverage itself plays a role in higher spending”? I thought that Medicare tends to reimburse for procedures at substantially less than private insurers’ reimbursement. Just that having universal coverage at 65 enables people to get care they otherwise were passing up at age 64? It would be nice if the chart broke down some of the age groups a little more. This makes it look like a sharp discontinuity between the 45-65 year olds whose share of spending is roughly equal to their share of population, and the >65 year olds whose spending is roughly twice their share of population. If it really is a discontinuity at 65, I’d conclude that it is more about medicare moral hazard than a high risk pool. But, if it is a gradual effect where 60 year olds are roughly the same as 65 year olds, then it is probably more about risk pools. You may have addressed what follows in an earlier posting, but I do not believe that any “health spending” chart or table should lump medical care together with custodial care without clearly segregating these numbers. This chart does so. It uses the same approach as the CMS data as displayed in the “National Health Accounts” of combining two entirely different types of spending: (a) medical and Rx drug care by physicians and other health care providers in outpatient settings and in health care institutions like hospitals, and (b) custodial care in a nursing home (or sometimes in one’s own home or an adult child’s home) for people who cannot bath, eat, get dressed, etc. without help. There are entirely different types of care with completely different financing, insurance, and care personnel arrangements involved. No health insurance policy that I have ever heard of (including Medicare) covers custodial care. Long term care insurance covers custodial care but not (except for Medicaid) medical care. Since relatively few people have private long term care insurance policies, almost all custodial care is financed by either (a) direct payments from own resources by the recipient, or (b) Medicaid for the poor elderly including those who have exhausted their assets. The implications for data on spending by age are huge. Custodial care is very rare for younger people (leaving aside infant care, which never makes it into charts such as this). It is common among the oldest of the elderly. Medical care spending also increases sharply with age, but levels off after age 65 at around $12,000 to $15,000 a year, rising only slightly to around $15,000 a year at the advanced age of 85. So about $30,000 of the alleged total of $45,000 at that age is custodial care, not medical care, delivered by people who cook, who wash dishes, who dress and undress, who change diapers, who push wheelchairs, who spoon food into the mouth, etc., not by health care professionals or in medical care settings. My beef is partly just a matter of simple labeling and transparency, but lumping these two categories of care together (and leaving out infant and child care by parents, and self care by most of us) massively distorts both calculations and common perceptions on things like the government share of health care financing. Addendum: I just noticed that the first posting, by Mathew, illustrates the kind of confusion that lumping these two categories of care creates. 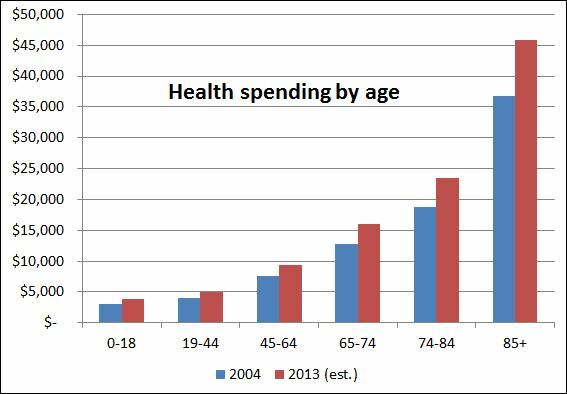 He clearly interprets the data and chart as showing a huge jump in medical care spending at age 65, and wonders it is due to moral hazard, risk selection, etc. But since medical care spending does not spiral upward after age 65, these speculations result from his being misled by the apples and oranges data, not from issues of health insurance design or medical care.